Find out how to credit your casino account, so you can play all your favourite games with real money and withdraw your winnings. If you would like to play with real money and be able to withdraw your winnings, you will encounter several options to handle your payment transactions at an online casino – overview of the best online casinos in Asia. For example, credit cards by VISA or MasterCard can be used as well as popular e-Wallets such as ecoPayz, iWallet or Venus Point (further details below). Of course, setting up a casino account is free and can be accomplished within a few moments. Alternatively, you can sample the games for free too without having to sign up, since all titles are directly available on the website. When depositing to your account, you need to consider that practically most available online casinos in Asia do not offer the local currency as a base currency (such as Yen in Japan – you will find the available currencies pointed out in our casino reviews). However, this poses no issue, since you can play the games using dollars instead. In this sense, it is somewhat similar to how online poker rooms operate. Therefore, after you have credited your online casino account using your local currency, your balance will automatically be exchanged into US dollars and displayed in dollars. No matter which payment method you are using, the transaction is usually carried out right away and will be instantly visible in your casino bankroll. Please note though, that with international transactions it might take a couple of minutes for your balance to update. Moving on, we describe the most important facts about the main depositing options for players in Asia. Details regarding the minimum and maximum limits can be found by checking the actual casino review under the “Banking Tab”. Deposit: Usually up to $1,000 per deposit (min. $10 to $20). Withdrawal: This depends on the casino, but usually not available. Fees charged by the casino: Usually not, but it depends on the casino. A straightforward and instant way of crediting your account is via a credit card. There is virtually no difference between a conventional purchase on the internet and depositing money in an online casino using this method. All casino portals, including the ones that accept player registrations in Asia, accept payments via credit card from companies like VISA or MasterCard – for example Cherry Casino or Vera & John (the latter charge 2.5% in fees, though). Once you are logged into your casino account, you need to look for the cashier’s area, which is usually marked by an easily visible button that says “Deposit” or something similar. The following menu that appears features all the available depositing methods for players in Japan. To transfer money using a credit card you just choose the corresponding method as well as entering the amount you would like to start playing with. Note: If you would like to take up the casino welcome bonus, make sure to opt in for the offer, before making the deposit. Mind though, that some casinos credit the bonus automatically. Further details on this can be found here. You will then be required to enter your card number as well as the expiration date on the payment form. Lastly, you will enter the verification number of your credit card, which can be found on the reverse side of your card. As mentioned before, deposits using a credit card are instant, but may take a few minutes to update on your casino balance. Please take note though, that many banks do not accept payments by online casinos, when it comes to withdrawals. Therefore most casinos available in Asia do not offer withdrawals where credit cards are used. In this case your alternative method of withdrawing your winnings would be via bank transfer or another non-card method. So called e-Wallets enable players to credit their casino account instantly. Additionally, they are the fastest option available when it comes to withdrawals. Once the casino has processed your withdrawal request, the money is immediately credited to your e-Wallet account, such as ecoPayz, iWallet or Venus Point. To open an account with any of the mentioned online payment services is free. However, crediting the actual e-Wallet account itself does in some cases incur a fee. Note: As with most online casinos, withdrawals must be made via the same payment method that was used for the initial deposit. Deposit: The maximum deposit depends on the casino and can range from anywhere between $1,000 to $20,000 per deposit (min. $10 to $20). 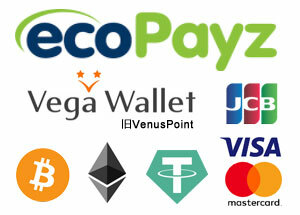 The online payment service ecoPayz was founded in 2000 and is based in the United Kingdom. To use this service you are required to set up an account at ecoPayz, which is free. In addition, the e-Wallet offers support in Chinese and Japanese as well. Depositing at an online casino using this payment method is of course free and instant. You can also apply for a prepaid card, which you can use like a normal credit card (no credit checks). This so-called ecoVirtualcard is a one-use payment card that works directly with your account at ecoPayz. That means you can securely pay for goods online, without displaying any of your personal or financial information, as it is designed for a one-off payment. iWallet is a popular online payment provider based in Hong Kong that can be used across Asia. The service enables players to deposit as well as withdraw funds without charge in an online casino. In fact, it works like any other e-Wallets service such as ecoPayz or EntroPay. Signing up for an account at iWallet (if you haven’t done so already) is effortless and also free of charge. Using iWallet you can do your banking using different currencies including CNY, HKD and JPY. Don’t forget though, that deposits are exchanged at the online casino, since in most cases it is not possible to set up your account with an Asian currency as the base currency. To top up your account at iWallet you can use a credit card or do a simple wire transfer via your bank. The latter method is free. Of course you can also use the service to take out money, for instance by withdrawing to your bank account or by using their iWallet VISA prepaid card. Deposit: The maximum deposit depends on the casino and can range from anywhere between $1,000 and $10,000 per deposit (min. $10 to $20). Venus Point is a popular online payment method in Japan and available at various online casinos. As with the other e-Wallets, both deposits and withdrawals are possible. However, you are required to set up an account, if you haven’t done so already. In addition, it can be used for withdrawing your winnings as well. As with ecoPayz and iWallet, Venus Point also offers Japanese support. Another option to deposit money in an online casino is EntroPay. The service was established in 2003 and is the first provider offering prepaid virtual cards in Europe. To create an account for a card doesn’t take any longer than 60 seconds. And it’s free, of course. However, the accounts are only available in USD, EUR and GBP. You can use the virtual card anywhere where VISA is accepted. It allows you to deposit money in the same way that you would use a conventional credit card. Please note though, that topping up your EntroPay card with a credit or debit card incurs a fee. Same applies when transferring money back from the e-Wallet account to your bank account. Deposit: Maximum deposit $5,000 per deposit (min. $10) at Vera & John. Bitcoin as a payment option is not your usual payment method and cannot usually be encountered in online casinos available in Asia. An exception is Vera & John Casino, which enables you to credit your account as well as withdraw your winnings using this totally anonymous crypto currency. Any payments undertaken using Bitcoin at Vera & John are free of charge. You have been lucky at your online casino and now it’s time to cash out those winnings. Before you rush to the cashier’s area and press that “Withdraw” button, you need to be aware of the player verification process, which is a requirement in any reputable online casino. The reason for player verification is to avoid any misuse of your account as well as to prevent illegal acts such as money laundering. Even though some online casinos only require you to verify your account when a larger sum of money has been requested to be withdrawn all at once, it is always beneficial to get this process out of the way early on. For example, after you have just signed up. That’s so that when your winnings are due for a cash out, you don’t have to wait on the casino to still process your documents. Verification is not a complicated task, but it can take the casino one to three days to fully process your documents. Depending on the casino, the copies of documents you provide can either be uploaded within your personal player account or mailed to the customer support team. In order to complete the account verification process, you are required to upload or send a copy of an identification document, e.g. a passport, ID card or driving license. Additionally, you are required to provide a copy of a utility bill for proof of address. The copies can be photographed or scanned copies. All details should be clearly visible. In regards to the utility bill, invoice or bank statement that you provide, it should not be dated more than three months, otherwise the casino’s verification team may have to refuse the document as a valid one. Should this happen, it doesn’t mean that you cannot re-send the appropriate documents in question in order to finalise the verification process. Note: If you have deposited using a credit card, it may be possible that you may have to provide a photo of the front and back of your card, too. To feel secure, you can cover the card’s number except for the first six and last four digits. Each online casino bonus is linked to so-called wagering requirements that need to be completed before the money from the bonus as well as any winnings generated from the bonus money can be cashed out. However, as a rule of thumb, you always place your bets using your initial deposit first, before the bonus money is activated in your account (the bonus is activated, once the initial deposit is exhausted). Hint: As you always play with your initial deposit first, any winnings from that money can of course be cashed out (in that case, the bonus money is forfeited). This is true for online casinos that apply wagering requirements on the bonus money only. Casino offers, whose wagering requirements combine the money from the bonus as well as the deposit have to be approached with caution as any winnings generated are directly credited to the bonus money balance – thus they cannot be cashed out, before the bonus requirements have been met. As hinted before, while in some casinos you manually opt in for the sign-up bonus, other casinos credit your account with the bonus straight after you completed your deposit. If you do not wish to have a bonus credited to your account, get in touch with customer service first, so they can cancel the bonus for you. This may be advisable for offers whose wagering requirements combine both the bonus and deposit money. Further details to consider when playing with a casino bonus include: how many times bonus money needs to be wagered in the casino games, as well as the available time frame in which to complete the requirements (usually between 14 to 30 days). Also, many online casinos have maximum bet limits, which usually comes to $5 per betting round (sometimes more). There are further details to consider – in case you are not familiar with the terminology, we advise you take a look at our bonus section.